Utsi, E (2012) “GPR Investigations at Westminster Abbey” in Forde, MC (ed) Proceedings of the 14th International Structural Faults and Repair Conference, Edinburgh, UK, 3rd to 5th July 2012. Utsi, E (2012) “The Shrine of St Edward the Confessor: a study in multi-frequency GPR Investigation”, Near Surface Geophysics, Vol 10 No 1, February 2012. Utsi, E (2010) “The Shrine of St Edward the Confessor: a study in multi-frequency GPR Investigation”, in Persico, R, Carrozzo, MT, Soldovieri, F & Tarricone, L (eds) The Proceedings of the 13th International Conference on Ground Penetrating Radar, Lecce, Italy, pp 405 - 410. Utsi, E (2010) “The use of Ground Penetrating Radar to extend the Results of Excavation” in Near Surface Geophysics, Vol 8 No 5, October 2010, pp 415 – 422. Utsi, E & Kruse F (2008) “The Villiers Street Burial Vaults: a Case Study in GPR Detection” in Chignell, RJ & Rogers C (eds) The Proceedings of the 12th International Conference on Ground Penetrating Radar, Birmingham, UK, 2008. Szynkiewicz, A & Utsi, V (2008) “GPR Monitoring of Pyramids & Large Structures” in Chignell, RJ & Rogers C (eds) in The Proceedings of the 12th International Conference on Ground Penetrating Radar, Birmingham, UK, 2008. Utsi, E (2006): “Improving Definition: GPR Investigations at Westminster Abbey” in Daniels, J & Chen CC, (eds) GPR 2006 Advancements: Expanding the Boundaries, 11th International Conference on Ground Penetrating Radar, Columbus, Ohio. Utsi, E (2006) “Sinking into Old Ground” in Jones, R E & Sharpe L (eds) ‘Going over Old Ground. Perspectives on archaeological geophysical and geochemical survey in Scotland” Proceedings of a conference held at the Dept of Archaeology, University of Glasgow, Scotland, August 2003, pp 174 – 184, BAR British Series 416. Utsi, E (2004) “GPR Timeslices from Ballachulish Moss”, Archaeological Prospection 11, pp 65 -75. Clarke, CM, Utsi, E and Utsi, V (1999) “Ground Penetrating Radar Investigations at North Ballachulish Moss, Highland, Scotland, Archaeological Prospection 6, pp 107 - 121. Utsi, V and Utsi, E (1989) “Ground Radar Survey” in Wilson, D (ed) “Excavation of a Romano-British Villa in Wortley, Gloucs.”, University of Keele Department of Adult and Continuing Education, Keele, 5th Interim report, pp 31 - 34. Carrick Utsi, E, Birtwisle, A, and Utsi, V (2014) "GPR Analysis of Bridgedeck Construction and the Detection of Delamination" in Forde, M (ed) Proceedings of the Structural Faults and Repair Conference, July 2014, London. Francke, J & Utsi V (July 2009) “Advances in long-range GPR systems and their applications to mineral exploration, geotechnical & static correction problems” in First Break, volume 27 pp85-93 (EAGE). Utsi, V & Francke, J (2008)“Low Frequency GPR Measurements on a Deep Mine Waste Dump” in Chignell, RJ & Rogers C (eds) The Proceedings of the 12th International Conference on Ground Penetrating Radar, Birmingham, UK, 2008. Utsi, V (2007) “Design of a GPR for Deep Investigations” in Soldoviere et al (eds) Proceedings of the 4th International Workshop on Advanced Ground Penetrating Radar IWAGPR 2007, June, Naples, Italy (ISBN 1-4244-0887-3). Utsi, V. (2000) “The Development and Different Modes of Operation of a Multi-Receiver Ground Penetrating Radar System” in Noon, DA, Stickley, GF, & Longstaff, D (eds) Proceedings of the 8th International Conference on Ground Penetrating Radar, Gold Coast, Australia, 2000, pp351 – 355. Utsi, E (2013) “Bringing up the Bodies: High Resolution and Target Definition Using GPR” in the Proceedings of the Progress in Electromagnetic Research Symposium (PIERS 2013), Stockholm, Sweden, 12th to 15th August 2013. Utsi, E (2012) “The Use of GPR for Asset Management”, in the Proceedings of the 11th International Symposium Geoinformation (ISG 2012), 25th – 26th September 2012, Kuala Lumpur, Malaysia. Utsi, V (2010) “How many points per scan?” in Persico, R, Carrozzo, MT, Soldovieri, F & Tarricone, L (eds) The Proceedings of the 13th International Conference on Ground Penetrating Radar, Lecce, 2010, pp 313 – 316. Utsi, E (2010) “GPR as an Imaging Device: some Problems and Potential Solutions”in Persico, R, Carrozzo, MT, Soldovieri, F & Tarricone, L (eds) The Proceedings of the 13th International Conference on Ground Penetrating Radar, Lecce, 2010, pp550 – 555. Utsi, V (1995) “Investigations using Impulse Radar”, in the Proceedings of the Conference of the Association of Consulting Scientists, London 1995. Carrick Utsi, E (2014) "The European GPR Association: Its Present and Future Roles in Engineering" in Forde M (ed) Proceedings of the Structural Faults and Repair Conference, July 2014, London. Utsi, V (1998) “Ground Probing Radar and Current EMC Directives”, Paper presented to the Institution of Electrical Engineers, London 1998. Utsi, V (2013) “Sub-millimetre Resolution GPR” in "Dérobert, X (ed) Proceedings of the 7th International Workshop on Advanced Ground Penetrating Radar, Nantes, 2nd to 5th July 2013". Soldovieri, F, Utsi, E, Persico, R and Alani, A (2012) “Imaging of Scarce Archaeological Remains Using Microwave Tomographic Depictions of Ground Penetrating Radar Data” in the International Journal of Antennas and Propagation, Vol 2012. Soldovieri, F, Persico, R, Utsi E & Utsi, V (2006) “The Application of Inverse Scattering Techniques to the Problem of Rebar Location in Concrete” in NDT & E International, vol 39, no7 pp 602 – 607, 2006..
Forest, R and Utsi, V (2004) “Non-Destructive Crack Depth Measurements with Ground Penetrating Radar”, in Slob, E, Yarovoy, A & Rhebergen, J (eds) Proceedings of the 10th International Conference on Ground Penetrating Radar, Delft, Netherlands, 2004,pp 799 - 802. Carrick Utsi, E (2014) "Target Resolution using Very High Frequency GPR" in Forde, M. (ed) Proceedings of the Structural Faults and Repair Conference, July 2014, London. Utsi, V (2011) “Use of High Frequency GPR for the Detection of Construction Faults in Roads and Built Structures” in the Proceedings of the European Geoscience Union General Assembly, Vienna 2011. Utsi, V and Alani, A (2010) “Detection of Leaking Joints in Water Reservoirs using GPR” in Forde, MC (ed) Proceedings of the 13th International Conference on Structural Faults and Repair, Edinburgh, 2010. Utsi, E, Birtwisle, A & Cook, J (2008) “Detection of Subsurface Reflective Cracking Using GPR” in Forde MC (ed) Proceedings of Structural Faults & Repair conference, Edinburgh, 2008. 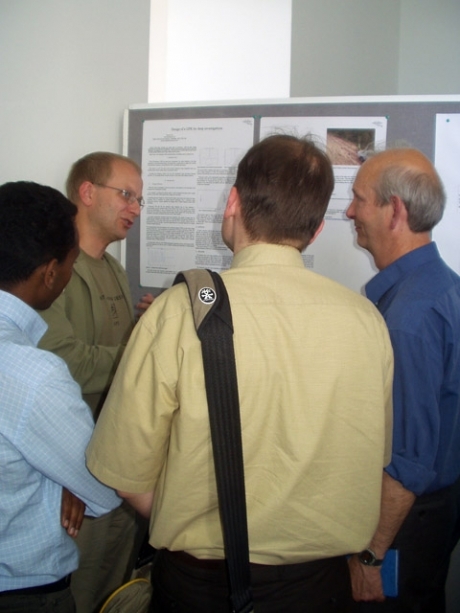 Birtwisle, A, and Utsi, E, (2008) “The Use of Ground Penetrating Radar to Detect Vertical Subsurface Cracking in Airport Runways” in Chignell, RJ & Rogers, C (eds) Proceedings of the 12th International Conference on Ground Penetrating Radar, Birmingham, UK, 2008. Utsi, V and Utsi, E, (2004) “Measurement of Reinforcement Bar Depths and Diameters in Concrete” in Slob, E, Yarovoy, A & Rhebergen, J (eds) Proceedings of the 10th International Conference on Ground Penetrating Radar, Delft, Netherlands, 2004, pp659 – 662. Utsi, V (2003) “Measurement of Minimum Delamination Width for GPR” in Forde, MC (ed) Proceedings of Tenth Structural Faults & Repair conference, London, 2003. Utsi, V (2014). "Detection of Fibre Optic Cables using GPR" in Lambot et al (eds) Proceedings of the 15th International GPR Conference, July 2014, Brussels. Utsi, E (2012) “The Importance of Utility Detection”, Plenary address, in the Proceedings of the 11th International Symposium Geoinformation (ISG 2012), 25th – 26th September 2012, Kuala Lumpur, Malaysia. Utsi, E (2004) “The Use of Ground Penetrating Radar as a Risk Mitigation Tool” in Slob, E, Yarovoy, A & Rhebergen, J (eds) Proceedings of the 10th International Conference on Ground Penetrating Radar, Delft, Netherlands, 2004, pp 795 – 798.